Started in 1937, Wallis and Son is celebrating 80 years in the business. The Cambridge garage is now being run by a Elliot Wallis, the third generation of the Wallis family. The entrance, with a 1985 Porsche 911 Carrera and a 1990 Ferrari 348 makes a good first impression but, while the garage offers specialist services for more premium cars and sells a host of luxury vehicles, it also services and MoT tests all makes and models including everyday hatchbacks and family cars. Anyone is welcome in this wonderfully situated, family-run garage. But setting it apart from the usual small garage, it also offers wedding car rentals, car sales, active rentals and valet services. The business also boasts a shop stocked with American goods and a petrol forecourt. The garage has a pit ramp, which is used to repair delicate classics. 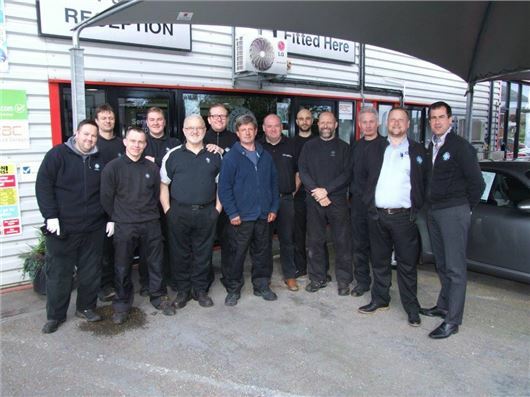 Elliot, the garage's director, has recently expanded the number of staff from seven to 11 mechanics, which makes vehicle turnaround much quicker. The garage contains 12 ramps with one in each bay, sometimes looking after 25-30 cars a day. One of the reasons customers return to this garage is because of the availability of numerous courtesy cars. This also enables the team to take their time in ensuring every car is perfect before it goes back home. None of the staff are commissioned for sales, meaning that the business is honest and reliable, driven by the importance of customer satisfaction above bonuses and speedy turnover. Wallis and Son has commercial ties with the John Lewis partnership and repairs their Waitrose delivery vans regularly. Cambridge University and other local schools also entrust their vehicles' care to this garage. The only job the garage does not do is bodywork and, if a car requires it, Elliot sends it to his friend’s specialist bodyshop. When asked what the hardest and most time consuming job this garage has done, Elliot replied that the Jaguar E-Type (pictured below) took two years to restore from the ground up, and was a very arduous job. Honest John readers have commented that Wallis and Son is “Certainly a firm to be trusted in the Cambridge area” and “After using Wallis & Son I will definitely be going back and wish I had always used them in the past”. They ensure quality and customer relationships are at the forefront of the business’ values. It's easy to see why the business is still a success after 80 years. Wallis and Son is in Barton, Cambridgeshire. Have you visited? Leave a review on the Good Garage Guide page.